This anime Kono Aozora ni Yakusoku wo, a school life and romance anime, is about a young boy named Hoshino Wataru, who lived in Tsugumi dormitory. He tells a story about his last three years at school on the island and the girls, how he met them. 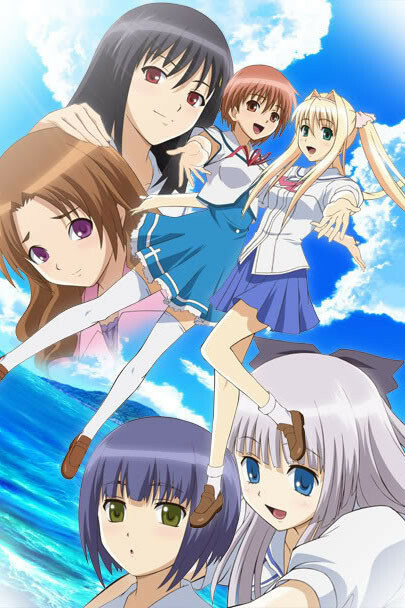 Story: Kono Aozora ni Yakusoku wo is an anime for those, who love school animes. I agree the storyline isn't that amazing as I hoped. It failed because the episode is cutted into two episodes for the six girls in this anime. The story is simple: Wataru is talking about the past, how he met the girls and how to solve the problems of the girls. I guess the maker of this anime didn't managed the anime to be like the game. Music: It's just too nice. The background music is nice, opening and ending music is nice too. Animation: I love the animation. Overall: In my opinion, it is not wasted time to watch it. I recommended for those, who love or like Shuffle! and/or Kanon. The storyline tried to be like the anime Shuffle!, but there was a limit at 13 episodes. It would be awesome, if there where more than 13 episodes to bring the storyline a little bit up. Some of you might know, that Kono Aozora ni Yakusoku wo has a H-Rated game, which the storyline is amazing than the anime. This is my first review so, don't kill me, 'kay :)? Sooooo Boring. I can't keep watching it! I usually can watch an anime and even if its not great I can still get though it because it is a show, and progresses and has a flow to it that will not feel like im just sitting there watching a soap opera that i do not want to watch. I gave an overall rating of 3/5 because I think that everything, from the story to the animation and the music. The point is, there is nothing where I can pick, and there is nothing that is extraordinary. Thus, the average rating. Because it is just like an average anime. You can like the song well enough after hearing it for some time, though it is not something that will make you remember forever. What that will make you remember forever is the story. The story is told in a different manner, that much I will admit. Initially, this story will bring in mind stories such as Fruits Basket or even Elfen Lied (the brighter part, mind you), where students lived together without or almost without adult supervision, where student have to prepare things and make their own life comfortable. It is those kind of anime that makes you wonder, hey, is that real life? Will I be able to cook as well as she is? Will we be that organised and neat if we were to do that? Chances are, we won't, so don't count on it. Yet, despite its common setting, this anime sets itself aparts with its manner of narration. Hoshino Wataru, the only boy in the dorm, is the one who narrates the tale by telling how he came to meet the girls one by one, and how they affect each other, and mostly, Wataru's life. I must say, the order of the story of each is VERY interesting... Initially, it may confuse one, but after going thru episode by episode, you will get used to it and slowly absorb yourself into the story. You start off with the ONE girl that probably makes the most impression on Wataru..... with a first impression as sleeping in only her undergarments, it is no surprise. It then continues on, with 2 episodes for a girl. Even if you do not remember their names by the end of the short 13 episodes, you ARE SURE to remember them. If there is anything I don't like, it would be Umi.... I can't stand girls like her, who is what I feel like a "spoilt brat" who can't get anything done. You might argue with me, but I have a HARD time trying to watch her episode. At the end of the anime though, you get to nod in approval of her character development. You get to say, ahhh, this girl has grown up after all! Indeed, this is a light-hearted and warm-filled anime that will pull you along with its footsteps. In the matter of 13 episodes, you will feel as if you know the last one year of the characters' life already! Everything I would expect from an anime based on a visual novel. Instead of splitting the anime up into multiple separate routes for each character (they kind of did in a way), they sort of made the story flow from one route to the other pretty much sticking to the original direction of the anime. I liked that. Of course I wouldn't have minded if this harem type of show actually had more of the harem elements applied but it did not ruin the show for me. Some people have said they found it boring but I sat through it all in 1 sitting. The show didn't bore me one bit. They even kept it fairly true to the Visual Novel with the artwork and the story. Music was pleasant as well. To me it felt more natural, something I may see or experience one day, and unlike other harem centered anime, there was no overboard rivalry or crappy going nowhere endings so this show gets 5 stars in my book. From the other revues either you'll luv it or hate it....obviously, this is for soft-hearted romantix, tho romance is really slight in this anime...this is about friendship...minimal fansvc... Characters, muzik & animation were superb...It's funny, sad, tragic & endearing...needless to say, tears were shed - I luvd it...my only beef is the length, want more! There isn't much to say about this anime other than it was average and forgettable. The characters were overly cliched as well as many of the story lines. it gets a C- to a C in my book. If your looking for excitement or large amounts of laughs, this isn't the anime for you. I made it 3 episodes in and couldn't take it any longer. It's just so boring and over dramatic. Maybe I came in looking for something else, maybe you will like it, but I sure as hell don't. All it is is a guy talking about how he met a bunch of chicks. That is lame, especially when you see just how CORNY the guy is. Don't forget the girls though which is very easy to do since they are all horribly overdone clichés. NONE of them are memorable or unique, you will forget all of them the second you stop watching. If you watch all of this you deserve an award for putting up with it. I couldn't make it past the first episode! Normally, I would try, but it's too much melodrama over too small an issue and far to early in the series to even have that degree of drama!! The animation seems very pretty and the music is good, but I just can't take the drama. Good luck to anyone else trying to tackle this series! A 2009 release going by the listing. Does not stand the test of time well. Very low quality animation. Even for 2009. Extensive use of panning and stills, poor character drawing even within the same episode. VA's don't do crying well, and it hurts my ears. Forced backstories that are not fluid and even if each girl had 6 episodes each, would still be forced for emotional traction, let alone any cohesion.. Very sloppy, below average, generic girl-du-jour harem show.